Pretty much, but I hope the old dub can live on in some way... 2020 will be its 25th anniversary... 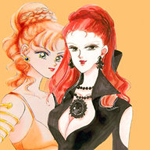 I know it's probably unlikely, but I'd really love if someone did a documentary about it, featuring interviews with all the voice actors, writers, producers, etc who worked on it, talking with fans, doing a thoughtful comparison between it and the Japanese version, and really just giving an in-depth look at Sailor Moon's initial run in North America. The DiC episodes? Probably not. I'm sure rights to their original music soundtrack did not go to Toei, and is probably owned by DHX Media (who owns DiC's assets). Cloverway had to license DiC's theme song for their episodes (and music cues for the movies). They would need to make a deal with both Toei and DHX, and it's possible Takeuchi wouldn't approve if she really does have as much say as rumored. FUNimation was able to re-release the original Saban/Ocean 53 dubbed episodes of Dragon Ball Z to DVD because they co-produced that dub and owned the rights to its original music. Re-releasing old edited anime dubs can be difficult. Just ask Discotek with their attempts to release Ronin Warriors. The Cloverway-dubbed episodes and the movies have no excuse since they were visually unedited with the original Japanese soundtrack and could easily be included as an alternate audio track. There might be something weird standing in the way there too, but if the similarly mangled Italian and French dubs can be reissued, so can this. I think Charlene Ingram was a vocal critic of the original Sailor Moon dubs, and with her gone, maybe Viz will be more open to doing something with the original dubs. Absolutely not holding my breath though. Ideally, the 82 DiC episodes could've been bonus features in an ultimate boxed set (maybe as SD extras on the corresponding discs with their uncut episodes, or on bonus DVDs) with the 77 Cloverway episodes simply as alternate audio tracks (maybe with the edited cuts as bonuses if they really wanted to get comprehensive). Materials should NOT be a problem, since they can just resort to ripping the ADV DVDs if they have to (or the audio from the Pioneer DVDs for the Cloverway episodes). Discotek does that sort of thing all the time, and they'd be allowed to do so legally if they have the license to the content. Have any evidence of that ? I didn't know till I read this Answerman column -> Answerman - How Does A New Distributor Get Permission To Reuse Old Dubs? But the general gist he implies is that licensing contracts are written so that EVERYTHING reverts back to the Japanese licensor. That is how Discotek has been able to put out so many discs with old dubs. Why would the DIC dub be the exception to the rule? It was a bit ambiguous. Well everything that is written / mooted here is all hearsay / second hand information. Based on the balance of probabilities and what is explained in the Answerman column the answer is more than likely that Viz technically does have the rights they just can't / won't due to some technical / commercial reason eg Japan says no / they don't want to go the trouble of/spend the money required to ready it for release. If someone has a trascript/scan of an interview / a video recording where this issue is answered specifically by Viz (and not just round the houses "it's not available" I'm sure everyone would be grateful for that. It's probably a rights issue. You may have forgotten, but Discotek couldn't secure the rights to "Ronin Warriors", only the Japanese version. Likewise, they couldn't secure the rights to any of the Mazinger Z English dubs - whether it be Tranzor Z or the Honolulu dub. Can we just accept that Viz plain does not want to release the old dub? Whether they can or can’t is irrelevant. They don’t want to. I think they should release the entire thing in a Rock the Dragon type release. I have little doubt that they can. But they’re not going to. Some people are convinced there is still hope in some form. I have albeit a little too strongly at times just been trying to make people aware of the commercial realities which make the chances nex to zero unless there is a seismic shift in the current landscape. I think Naoko/PNP would not approve. If memory doesn't fail me, when the manga was re-released worldwide Naoko/PNP demanded the characters' names to be the original names. While I think TOEI would care less, I don't think Naoko would let VIZ use the old dub. 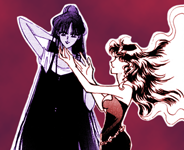 Unless, of course, there is some kind of breach in the contract, and VIZ gains the ability to release the old dub much like a company in Argentina/Chile released "Sailor Stars" on DVD. And that was a quite cheap DVD with fan-subs. Many countries like Germany, Italy, France released the manga with the Japanese names etc, but they reused their old dubs. I think Naoko is not the one to blame. Viz simply find it financially not worth it and honestly I believe them right. For every one fan of the old dub there are at least 3 hating it with passion. I think if VIZ can release the old dub, it will... they would finish releasing the 90s series and Crystal... let the hype fade... and then bring back the old dub for those nostalgic fans. VIZ is not stupid, they want money as any company does. They know DIC dub has it's fans and I'm sure they are considering releasing it someday, but I remember when they got the rights, to convince TOEI they made a promise of a new dub, because there were several companies trying to buy the rights. So right now they are making a HUGE investment on that dub, and giving for "free" the DIC dub doesn't help their business. Let's just wait until Stars is released and if sales are good, they will try to sell more. I'm pretty sure Justin Sevakis made a similar post in the past mentioning the music situation, and in that very post mentioned the difficulties often involved in older dubs often not reverting back to the Japanese rights holders. It actually wouldn't make sense for an original score to revert back to the Japanese rights holder if it was an original work. giving for "free" the DIC dub doesn't help their business. Not really giving it for free if people would have to pay money for it. If anything Viz not releasing it is just incentive for people to pirate it online or buy a used copy of the adv/pioneer releases from a third party vendor. Both of those options involve Viz not getting money where they could be. VIZ is not stupid, they want money as any company does. They know DIC dub has it's fans and I'm sure they are considering releasing it someday, but I remember when they get the rights, to convince TOEI they made a promise of a new dub, because there were several companies trying to buy the rights. It still boils down to the question of is there ENOUGH of a market to justify the costs of producing / marketing a release. Viz doesn't get out of bed for anything less than 10,000 copies. Would they really sell that many? I have a feeling that after they're done with their redub that they're probably gonna release the old dubs on DVD. Your thoughts? Why wouldn't the music revert if every other asset, including performances did? Even if the company licensing Sailor Moon couldn't initially get the rights to the old anime music (which is likely why it was re-scored), all materials associated with the dub go back to the licensor. Any work done for the dub would essentially be a work for hire. No, it really doesn't make sense, but thanks to Japanese copyright law, it seems all rights to anything officially-released for Sailor Moon end up going back to PNP, not even Toei. Toei doesn't even have complete control over the anime it made. If there were an issue with the old dub music, then the old music wouldn't have been used when the license changed hands, but that the music was moved in the movies suggests that it could be used in a dub licensed to another company. They would have sold that amount had they released the old dub without making a new one, no question. Between the people who wanted to relive their childhood and, more importantly, the people who would have supported Sailor Moon in hopes of getting a new dub, they'd have hit that figure. However, they won't sell that amount now because they actively chased away and antagonized old dub fans by investing in a new dub. The assumed that the diehard fans would make up the difference, even if it meant incurring more costs. I have a feeling they miscalculated. Because of their actions, those who would have been interested were pushed away. I don't think they have miscaluted by releasing new dubs first. Look from their and most fans of the franchise point of view. People have petitioned for years for a new dub specifiacally, there were tons of blogs, forums etc full of people pointing everything wrong with the old dub, the censorship etc, people has been asking for years majors publishers if they can ibtain and redub the show close to the original material. Imagine after so many years if Viz released the old dub first. I really cannot imagine the hate, frustration and all the attacks on the company by the majority of the fans. They are doing business the majority matters. If they cathered to the minority first they would have damaged their reputation before even releasing the new dub and the majority that wants a new dub and closer to the original scripts would have lost believe in them. Sailor Moon license in USA was big specifically because of new dub and remaster. That is what the majority wanted. The reissue of all the old dubs is something a very small of the fan base wished for, and in front of the potential loss of trust if the bigger group of fans, VIz did the right choice and still failed to deliver on the viddeo quality deoartnent.